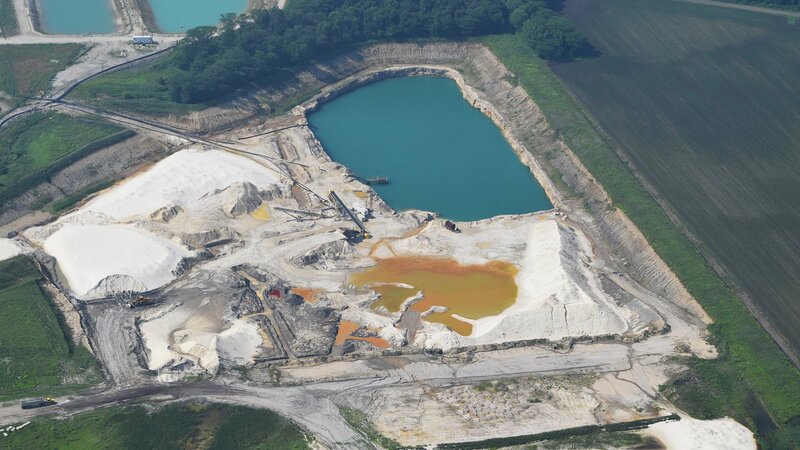 In late 2012, three environmental groups filed a lawsuit on behalf of several LaSalle County residents over a proposed silica sand mine on the eastern edge of Starved Rock State Park. The residents, who lived directly adjacent to the site of the proposed mine, were concerned about its effect on their property values and their health, given the lung-damaging particulate matter that often comes from such operations. The environmental groups – Sierra Club, Prairie Rivers Network and Openlands – raised additional questions about the mine’s impact on wildlife and the surrounding acres of soil-rich land, which is coveted by energy companies for the fine-grain sand found deep below the surface that serves as an essential ingredient for hydraulic fracturing, or fracking. The site contains an estimated 30 million tons of sand reserves. In their complaint, the groups also pointed out that the Illinois Department of Natural Resources’ Office of Mines and Minerals had failed to consider 13 criteria for proposed mines outlined in the state’s Mining Act. “The courts have narrowly understood the law and as a result have excluded people who are suffering or have the potential to suffer real and significant harms from these kinds of operations,” said Mark Templeton, director of the Abrams Environmental Law Clinic at the University of Chicago and one of the attorneys on the case. That could soon change. Illinois attorney general candidate and state Sen. Kwame Raoul, D-Chicago, plans to file a bill this month that would amend the state’s Administrative Review Law to ensure residents are able to challenge permits issued by state regulators, including the Department of Natural Resources, Department of Agriculture and the Illinois Pollution Control Board. Under the planned bill, residents would have legal standing to sue over environmental concerns such as air pollution, contaminated groundwater, offensive odors and more. Currently, only “affected parties” have standing in such cases, Templeton said, meaning that permits can be challenged only by the agencies that issue them or the companies that receive them. “Polluters unfortunately sometimes take advantage of the most vulnerable, and those individuals don’t have a right to action to hold those polluters accountable,” Raoul said last week during an environment-focused forum for attorney general candidates hosted by the Sierra Club. Although the project eventually stalled, the 2010 case is cited frequently in dismissing cases brought on the behalf of residents living near factory farms and mining sites. The bill is likely to face opposition from industry groups that represent factory farms and mining companies, such as the Illinois Association of Aggregate Producers. A representative for the group said he would withhold comment on the bill until it is formally introduced later this month. In addition to Raoul, Walling said the bill is likely to have a Republican sponsor in the General Assembly. “We’ve struggled with this issue for a while, and this year really seems like the political year that we’re able to make some movement on it,” Walling said, adding that she expects the legislation to receive support from outgoing Attorney General Lisa Madigan, whom environmental advocates have considered an ally. Templeton said the legislation is necessary to change the existing dynamic, where residents are powerless to challenge decisions that have a major impact on their lives. Jan. 24: The city’s lawsuit comes a week after attorneys at the University of Chicago filed their own lawsuit against the steel corporation. “This Great Lake is our most precious natural resource and we must preserve and protect it,” Mayor Rahm Emanuel said in a statement. Dec. 22: The lawsuit filed Wednesday by Illinois Attorney General Lisa Madigan and Lake County State’s Attorney Michael Nerheim alleges that Baxter violated a federal permit several times over a five-month span by releasing contaminated water that exceeded pollution limits. Feb. 27: Illinois Gov. Bruce Rauner is supporting a bill that would require testing of groundwater near quarries where construction debris is dumped.